Calculated or Automated Nested Sorting? In the workbook below I am using Steve Wexler's / Joe Mako's approach to Likert Scales with hundreds of topics rather than just a few. My difficulty is the sorting. As in Steve's original, I would like the topics to be sorted by their average score. 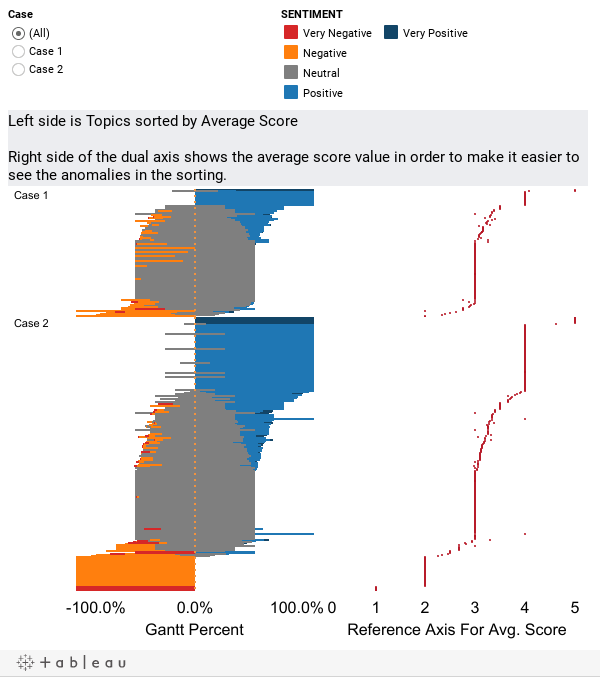 If you set the view to show just one case then from the right hand side of the view (which shows the value for the average score for each topic in turn) you can see that the sorting is working fine. However if you choose to display more than one case then the sorting breaks down - the right hand side of the dual axis allows you quickly to spot the average score values which are out of sequence. Can anyone tell me the error in this worksheet, please? Are there any double answers for a single row? Can you sort by a set instead? This would be driven by a large volume of changing web and social media data where you would not want the manual step in Tableau of creating sets to achieve the sorting. If sets could be the answer though (and I have no idea if they are), could you create the set either by calculation concatenation or custom SQL? I see where you're coming from. I'm just asking to do a nested sort aren't I? To which the usual answer is to sort on a manually created set and that's really not the approach that's going to be viable in practice here. Have you any examples or pointers on how you might approach set creation as you say either by calculation concatenation or custom SQL? I don't suppose you can share a tbwx? I really was just throwing a possibility out there - without futzing with your data I don't even know if what I'm saying makes sense. If you click on the image in the original post it will take you to the source Tableau Public viz and you can download from there. Futz away! Here's a nested sort using a set (which I firmly believe to be dynamic, so new data should not be an issue), and a nested sort using a calculation. They both seem to now sort correctly I think. I don't know whether to be upset or delighted that the solution is that simple! Brilliant stuff - thank you for that Alex - much appreciated. Another challenge coming up shortly.